Alrighty then.... Valentine's Day is just about here. A couple of last minute paper crafting ideas that start with a simple rectangle caught my eye. Each one is relatively quick to do, so maybe you can find a moment to try them out this weekend. A tutorial for this beauty can be found on Eat Drink Chic. Amy Moss, the creator of the lovely site, is using it as her engagement party invitation and also treated readers to the suggestion of adding a quote to make an elegant valentine. And this idea has been making the rounds lately, but if you haven't seen it yet, it's pretty neat... especially if you're familiar with the tear-off flap from a Netflix envelope. You know, the one that has to be thrown away or put on the recycling pile whenever a new dvd arrives in the mail. 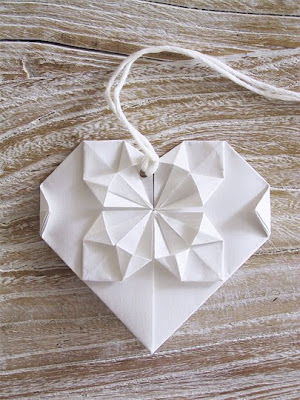 Have a little fun with it first, by making this origami heart. More rectangle designs (usually origami folds start with a square) are available at NetflixOrigami... a swan, crab, box, and more. I just received the nicest email from Sonja in Ireland who shared the link to a video tutorial on her blog, Craft-Werk, to make this three dimensional heart. She's so right that it helps immensely to see origami 'in action'. Thanks Sonja! I happened upon your site yesterday (the quilled roses??? be still my heart!) And now you show me a use for all those Netflix sheets! LOL, I KNEW there was a reason I kept all of them! I love your blog! Very nice :) Paper paper paper <3 My husband went to the University of Delaware, GO BLUE HENS! 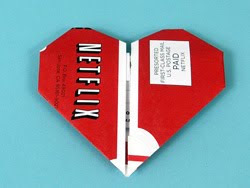 Just an FYI - the Netflix origami is its own site with no affiliation with Netflix. Melanie, too funny. :D Good for you for saving them! 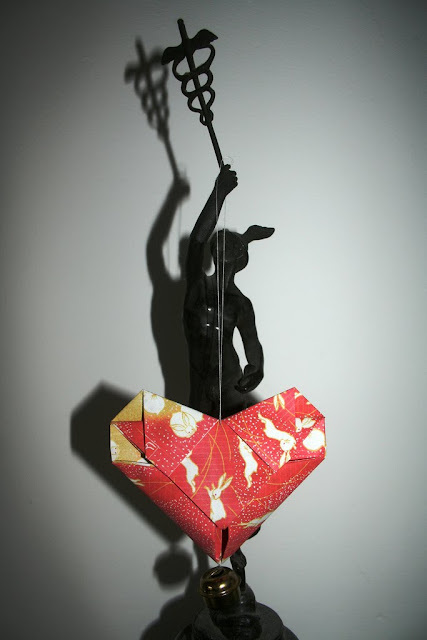 That heart is the only origami piece I can make from heart. (Get it??) I fold the little side flaps under but this looks good too! There are lots of sites featuring dollar bill origami too. Stefani, lol, got it. Good point about the dollar bill folding sites. I think that's where the first heart in the post originated. It never fails to amaze me how creative people can be!